One of the things we inherited from our British Colonialists, was the fact that in Malaysia, we drive on the left side of the road! Most British Colonies have the same ruling but what happens if you want to drive in a country that drives on the opposite side? If you are like me, then one of the first things I do when on holiday is to rent a car when I arrive then you will need to pay attention to these helpful tips. Some are rather obvious but it is best we cover all our bases and leave nothing out. This is a no-brainer but find out before you travel. You will also need to do some research on basic traffic laws that may be different in a particular country or state in that country. Like going on a red at a traffic signal in certain conditions. Another example would be the significantly lower driving speeds around school zones in the US. And note the fines are double if you get caught. First thing you’ll notice is that you will be seated on the other side of the car as a driver. Though it is a given fact but it is worth noting that you should give yourself some time to get used to the change. The accelerator and brake pedals are in the same position. But by just having all the other controls, gear shifts and signal switches the other way around, you might get thrown-off and disoriented if you have to act fast in a driving situation. Being a creatures of habit most of the things you do when driving can be instinctive and second nature without having to think too much about what you do. But in a situation where everything is the other way around removing an additional sum to the equation will help a lot, so choose an automatic transmission and don’t bother about the gears. The first thing to keep in mind is to keep to your right which can be especially challenging should the roads be empty without any oncoming traffic to remind you. Staying on the farthest right lane on a multi-lane road, being a slower lane will provide you the allowance to respond to a new road system and traffic flow. The farthest right lane is also the lane you will cut into when two roads merge, while the left lanes are the faster lanes and where you would use when overtaking. This is a helpful tip when making a turn at a junction - Right tight, left loose. When turning right make a tight turn into the right lane. When turning left make a looser turn (meaning you giving more space) and turn into the right lane. 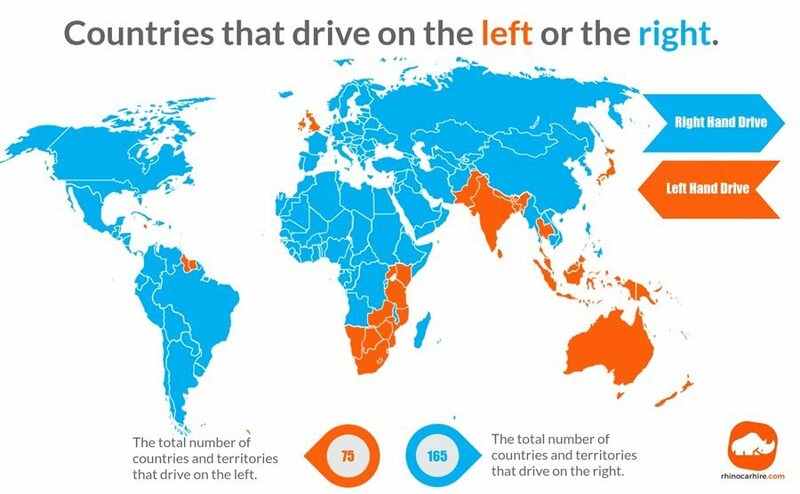 Regardless of what country you drive in be it on the left or right side, it always helps to get familiarized with the journey. Research if the countries support apps like Waze or Google Maps. These are handy as you can download the maps and still use them while not using up data. Above that you can use a navigation device or a co-driver to guide you along the way. Again, having less to grapple with increases your ability to cope with a new driving experience. When all this is said and done, the MOST important thing to do first, is to make sure you are legally able to drive in that country. Most countries do accept a legally obtained Malaysian Drivers License that is valid. However, to be safe, it is best if you convert your license to an International Drivers License. Head over to any JPJ (Jabatan Pengangkutan Jalan) office, or A.A.M (Automobile Association Malaysia) to have it converted. The fee RM150 per year. TAYARIA believes in the philosophy of empowering customers with freedom of choice by offering a wide range of multi-brand tyres.